IMPORTANT: Beach House Rental is NOT Included. You rent your own Wedding Friendly Beach House. They are Separate ranging from $3,500 to $6,000+ per week. Beach Houses during peak season normally rent by the week only. - Consultation either in person, e-mail, or phone. - Legal filing of marriage license after the ceremony. (bride & groom purchase license at clerk’s office). The bride and groom each pour sand from individual bottles into one bottle to symbolize the couples unity. The bottle of sand is then a keepsake for the couple. - 3 Pole BAMBOO ARCH decorated with several choice of color fabric, also in burlap/tan color. 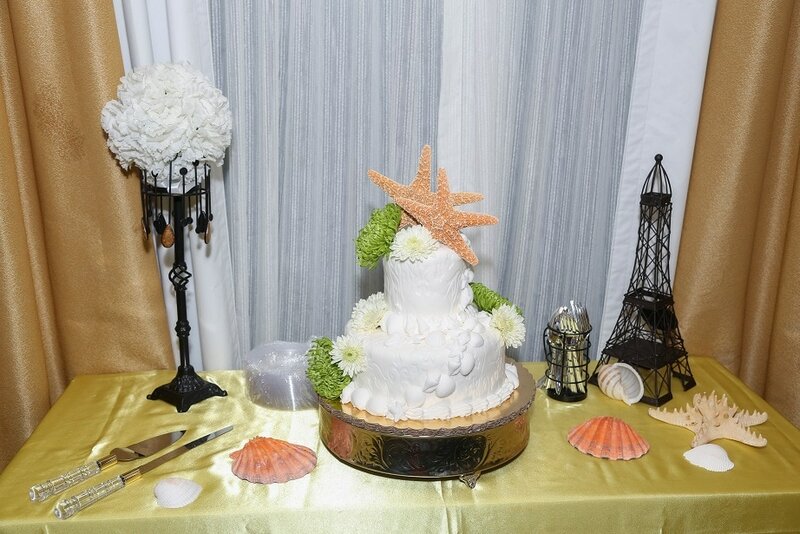 - Complete with buffet and cake table decorations and props. All tables, chairs, tablecloths, centerpieces, chafing dishes, serving utensils, disposable deluxe dinner ware, and cups provided. 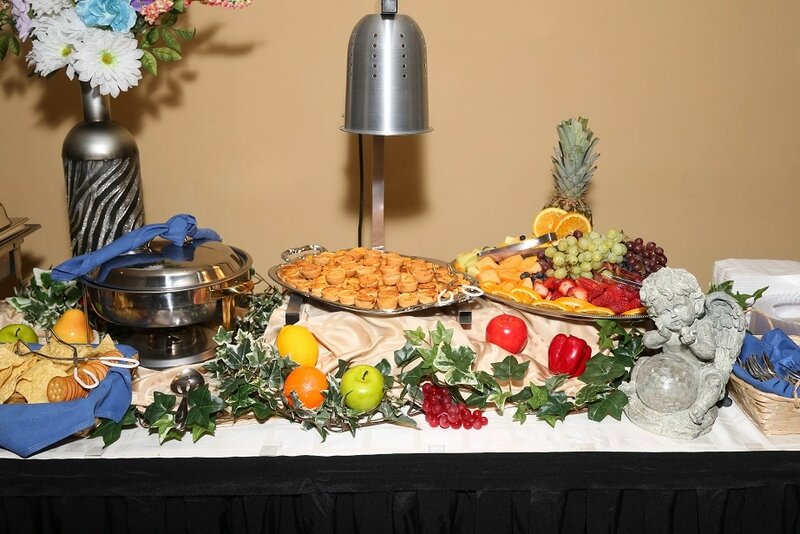 - Deluxe Disposables: Heavy duty Napkins, clear Dinner plates, Cake Plates, and "Real Like" flatware. - Two hours of photography (1 hr. on the ceremony & 1 hr. on reception). - Delivery within 25 miles round trip from our Orange Beach location... Our delivery range extends beyond 25 miles, please call for a quote to your location. * 50 People or more, Please Contact us for a quote. 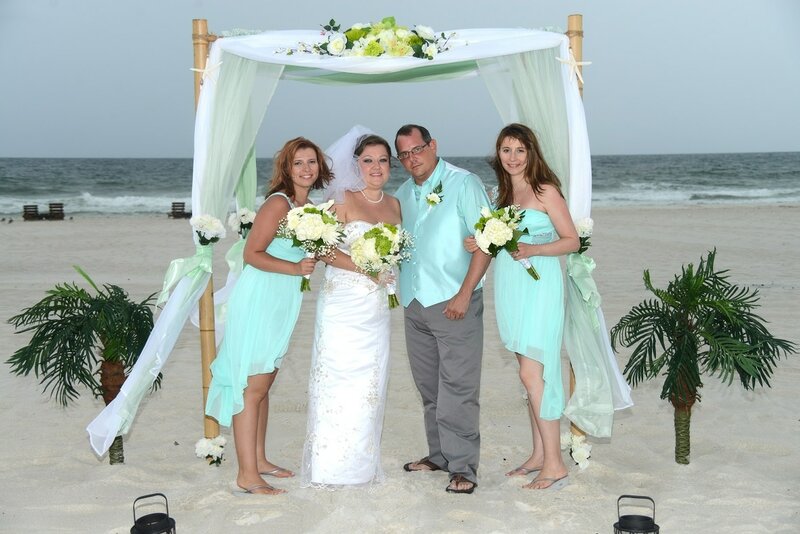 Alabama Beach Weddings, Beach Weddings on a beach in Alabama, Orange Beach Alabama Weddings. - Spinach and artichoke cheese dip. - Southern seasoned Country boiled shrimp. Locally made Smoked Conecuh sausage. - Bread rolls and butter. - Warm Artichoke and Spinach Dip served with tortilla chips. - Seasonal fruit display tray. - Warm Creamy artichoke and spinach dip served with tortilla chips. - Mini quiches—savory pastries with cheese and bacon. 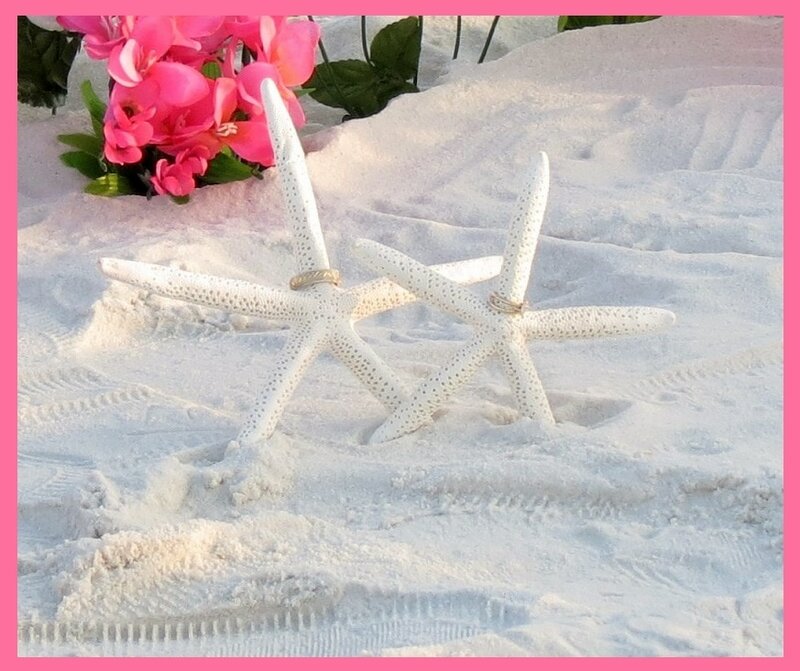 * SET UP: Normal set up is included in our Beach Wedding Packages . However, additional delivery and/or set up fee may apply depending on the accessibility to the delivery and/or set up location. 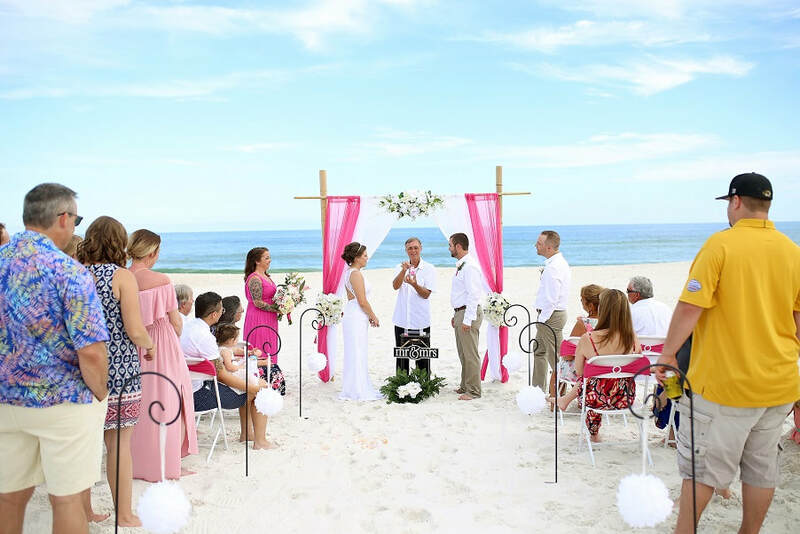 For example, if the set up location is farther than 20 miles from our location, or more than one set up and/or delivery location for one wedding ceremony or reception, or more than 25 yards from the road, or if there is no clear access to the set up location and we have to go around houses or dunes to set up, etc. All of the above equals to more man hours, more time & money. -- All Prices are PLUS 10% Local Tax, where applicable. -- * Package prices may increase during national holidays and special local events. You are welcome to bring your own Minister or Photographer, if you want, however we cannot credit you for that on a package. Thank you. A non-refundable deposit will hold your date, this will vary depending the package. All balances are due 45 days before the wedding date. 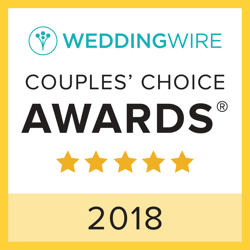 Wedding Packages are subject to change and availability. Sale is valid for limited time only, sale price apply to new purchases/booking only. 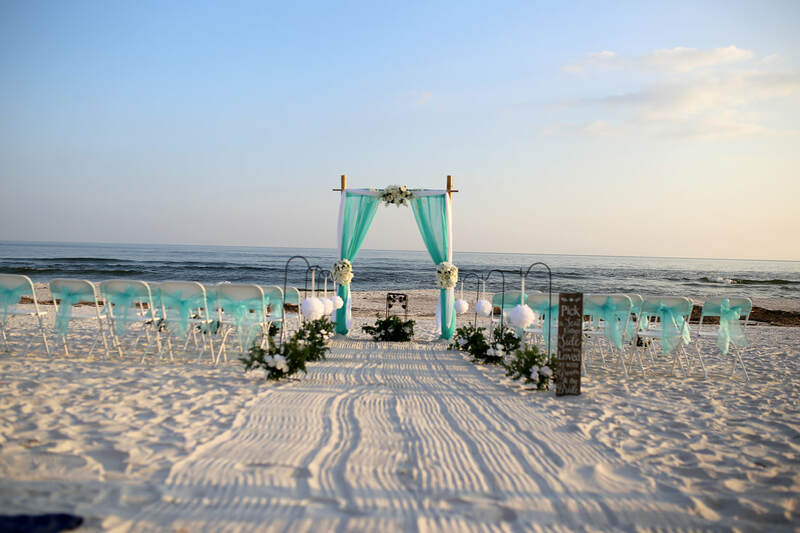 **The wedding packages, ideas, services and concepts offered on this site, as well as the "one stop shop concept", (A facility offering all the services of a wedding, including flowers, minister, set up, rehearsal, wedding cake, catering, photography services and wedding ceremony, in any combination thereof) are intellectual property and copy written as such, by Beach Weddings Alabama. Any attempt to replicate all or part of these packages or designs by any competitor is strictly prohibited and will be met with legal action. Content copyright 2019. 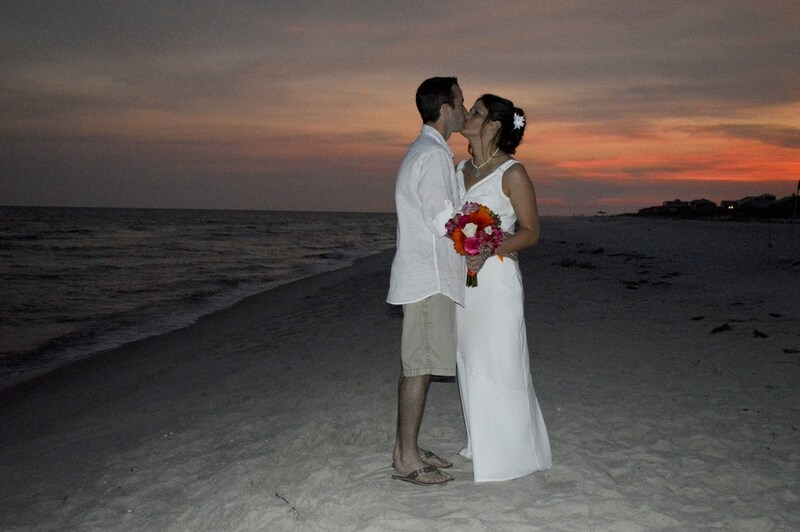 Beach Weddings Alabama. All rights reserved.